This is a project going on a the University of California, San Diego. They call it the Heads-Up Virtual Reality device, or HUVR (pronounced like the word “hover”). I call it awesome. HUVR “couples a consumer 3D HDTV panel with a half-silvered mirror to project any graphic image onto the user’s hands and/or into the space surrounding them”. Apparently, the user’s head is tracked in order to get the correct perspective, and there is a haptic feedback device on hand for manipulation. I noticed that their haptic device looks a lot like a Novint Falcon, which I believe was designed for 3D gaming. Personally, I think that the possibilities for this technology are limitless. For example, medical researchers can use this for 3D manipulation of brainscans from an MRI. Archaeologists can use this handle an artifact that is too precious to be handled with the hands-on approach. Best of all, this technology has come relatively cheap. 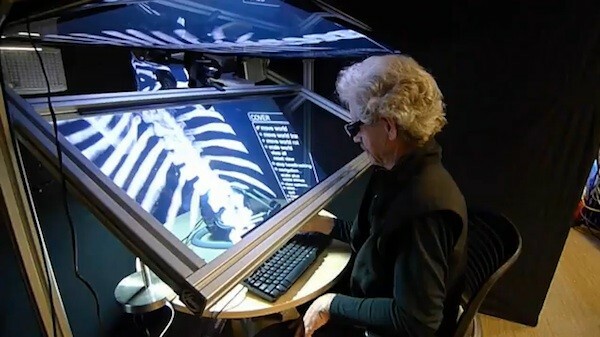 It uses a $2,300 Samsung 3D TV and a heads up virtual reality system that costs $7,000. I look forward to the day when it costs as much as a desktop computer. I can totally see desktop and possibly even laptop computers being like this.